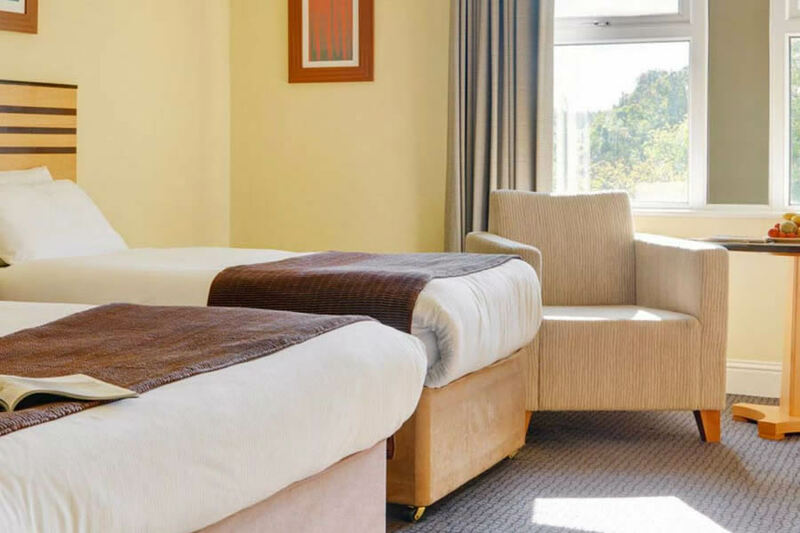 Breaffy Woods Hotel in Castlebar is perfect for family breaks.Â Formerly known as the Breaffy International Hotel, this exciting premises offers guests a quality break. From Galway: Take the N17 via Tuam to Claremorris and the N60 from Claremorris to Castlebar. Breaffy House Resort is on the left-hand side as you approach Castlebar. Alternatively, take the N84 via Ballinrobe to Castlebar and the N60 Claremorris Road out of Castlebar. Breaffy House Resort is on the righthand side as you leave Castlebar. From Knock: Take the N17 to Claremorris and the N60 from Claremorris to Castlebar. Breaffy House Resort is on the left hand side as you approach Castlebar. From Dublin: Take the M4 then N5 via Swinford to Castlebar and the N60 Claremorris Road out of Castlebar. Breaffy House Resort is on the right-hand side as you leave Castelbar. Stretching from Lough Corrib in the south to Killala Bay in the north, Mayo boasts some of Irelands foremost attractions including stunning scenery, superb fishing, excellently preserved historical monuments and buildings, great golf courses and of course some of Ireland's finest beaches..
Will book to stay in Breaffy House in Future Woods hotel provided us with room 3018 1. No chairs to sit on in room no table 2. Very limited drawer space, 3. Breakfast on Saturday morning in Mulberry Restaurant Breaffy House Hotel was far superior to that provided in Woods Hotel restaurant on Sunday morning. Great stay, would definitely recommend, especially if attending a wedding in the Breaffy House Hotel, its a one minute walk away. I was very happy with the friendly staff in the hotel and how clean the hotel and the rooms were. The family room was adequate size and as the kids went free in the room we had to pay a small charge of €5 per child for each breakfast which was well worth it. The food in both the Woods hotel and the Resort hotel was lovely. The Woods hotel was very quiet so we spent some time in the Resort Hotel using the facilities. We were happy will all of the facilities. The outside kids activities etc were a bit smaller than we expected especially the playground. Also the outside of the hotel in places needed so touching up painting wise etc but that might have been on the cards to do given that were were there in May. Overall i would definitely return as it was good value for money. Lovely clean room. Kids loved the Kids Club games and disco, girls were very good at replacing burst balloons! Swimming pool was excellent, staff very vigilant and friendly. Only found out about the 'football' behind reception on the last day, and didn't find kids activity place in The Woods or Crazy Golf. Breakfast was great, perhaps a little warmer. Overall, a brilliant weekend. Great 2 night stay in the Breaffy woods hotel. Great location. Excellent food. Spacious family room. 2nd year in a row to stay there for the Mayo Pink ribbon charity cycle. Will be booking again next year all being well!! Had a great time here, room was very clean and comfortable. The kids entertainment was brilliant, they really enjoyed it. We didnt like the food in the restaurant and the breakfast, very basic and overpriced for what we got and we were left waiting half an hour for our dinner. The pool was nice, a little bit cold in the dressing rooms. We would still come back as the kids really enjoyed it. lovely big room and clean.wheelchair lift not working first morning and staff did not know much about it.in was fixed that day.breakfast not great. People smoking at main entrance all day cigarette butts all over the ground it was disgusting and on Sunday morning after a wedding there the night before empty beer bottles on the ground outside at 11.30am. Not a good impression for families as we had our 4 year old with us. My husband ordered a burger in the bar no sauce on it so dry and the black pudding was missing. We asked for salt and pepper eventually we got it. Breakfast was lovely have to say. I wouldn't go back in afraid. Brilliant set up for children!! Two sites are within walking distance from each other Food excellent No complaints at all and two happy children !!! Nice hotel. Great kids club. Good food and a clean spacious family room. Kids loved the pool. We will definitely go back. We stayed here Friday 11th September. Its a lovely hotel. The rooms are very very comfortable and spacious. We dined in their sister Hotel Breaffy house in their award winning restaurant. It was a fabulous stay and we will definitely return. When we arrived she we got overcharged, she forgot to take off deposit, then she asked us for €5 per child for breakfast and €10 per dinner for child which we didn't mind and she still over charged us by a couple of euros but didn't mind because we were still getting a bargain. Breakfast was ok but man that showed us to our seat was very cheerful which was nice to see. On the following day at dinner we went up to pay for our drinks and they tried charging us for an extra soup that no one ordered. The next day we got locked out of our rooms and when my sister checked out they said she hadn't paid up fully but she explained to the reception staff that we paid fully on the day we arrived and other things we paid as we got. Then when we checked out the following day. The receptionist said that there was a query on our bill and needed to call the supervisor this to me was the last straw I told her then of how we were treated, overcharged and locked out of our rooms she asked us the ages of the children and how many adult which was 5 adults and 6 children aged 10, 8, 8, 7, 6, and 3. She just apologised for us getting locked out and said we are paid up full and other than that did we enjoy our stay we said we did only for what happened. I will say that there was one receptionist who was very nice who helped us on the morning of the 30th July. We will not be staying here again. Mayo is a great place to visit though. Stayed in Breafy Woods Hotel with a large family group (Grandparents, Parents and children of various ages) and everyone thoroughly enjoyed they're time. The hotel was excellent value for money, catering for both young and old. There was also a lot to do regardless of the weather and the staff were very accommodating and friendly. Great day, will defiantly be staying again. A really nice family friendly place to stay. We were in a large group and the kids had a great time with the kids club/discos. The pool was really nice and there was even a mini crazy gold. It was also nice that there were two hotels on site one that specialised in the families (woods) and the other catered more for adults (house). You could use facilities for both hoever kids are only allowed in the Woods Hotel Bar. I think this is a great idea as it suited both families and couples. I will certainly return. We had a nice stay at the Breaffy Woods Hotel. The appearance of corridors could do with an upgrade. Maybe a bit of paint & a bit more attention to hovering around the edges etc. The room itself was sufficient. We had a little kitchenette which was useful except the fridge was a bit on the hot side!!!! The shower had a curtain around it however this was a disaster as it led to the floor being flooded if you weren't careful in the shower. Overall the facilities were good and the breakfast was very nice. Just back from a family weekend in Breaffy Resort. We stayed in Breaffy Woods, rooms were very clean and comfortable. Great facilities onsite. We only ate breakfast in Breaffy Woods Hotel as restaurant was basic and in need of a revamp. Both the restaurant and bar food in Breaffy House however were absolutely fabulous. Staff in both hotels extremely helpful. Overall a great hotel for a family break three of the families had young children and Breaffy Woods was ideal for us but I would recommend that couples or families with teenagers stay in Breaffy House. I was a bit disappointed by our stay as previously we had stayed in Breaffy House and found it very good. Our room was perfectly adequate, but the breakfast room was unappealing and run down looking. The breakfast was not very good. The dinner was also very basic and the dining room was like a crèche. I realise that it is a family resort but maybe there should be a separate dining area for people with young children or a time allocated for family dining. Very good hotel for families with children, staff were brilliant. Activities and amenities were great. The only down side would be that the food at the restaurant wasn't great. Great spot for families & plenty to do in the hotel & surrounding areas. There was no doubt that the hotel was value for money. The only thing that I would find fault with was that the restaurant was more like a canteen and there was absolutely no privacy to enjoy a meal in comfort. We have been looking at this hotel online for a couple of years and had fancied it and we are so glad that we did. There is a fantastic kids club that starts with the breakfast train in the morning, they collect the children from your room at 9am and then they do games for an hour, arts and crafts for an hour and cookery for an hour. We collect them again at 1pm. Then in the evening the entertainment starts at 6pm in the bar. There is a corner allocated to a big screen and seats for the showing of a movie. Then at 7.30 when the movie is over there is a kid’s disco which rivals those in Spanish resorts, it was absolutely fantastic and our girls were dancing all night long. While the kids disco is on there is also extras like face painting/tattoos, hair chalking, balloon modelling and a candy buffet, all for an extra cost. The disco ends at 9pm and you can stay in that bar or move to the other hotel for live music with the kids if you like. Dinner was lovely. Breakfast is until 10.30am. Wifi is available in the reception of Breaffy Woods Hotel but does not stretch much beyond the reception area, it is also only available in the reception area of Breaffy House Resort which is the hotel closest to the kids club and where we waited with a cup of tea/coffee for them to finish at 1pm. The swimming pool is nice. There’s a steam room and Jacuzzi too. Very clean with lots of floaty toys for the kids to use while in there. Towels are available to borrow for no extra charge. 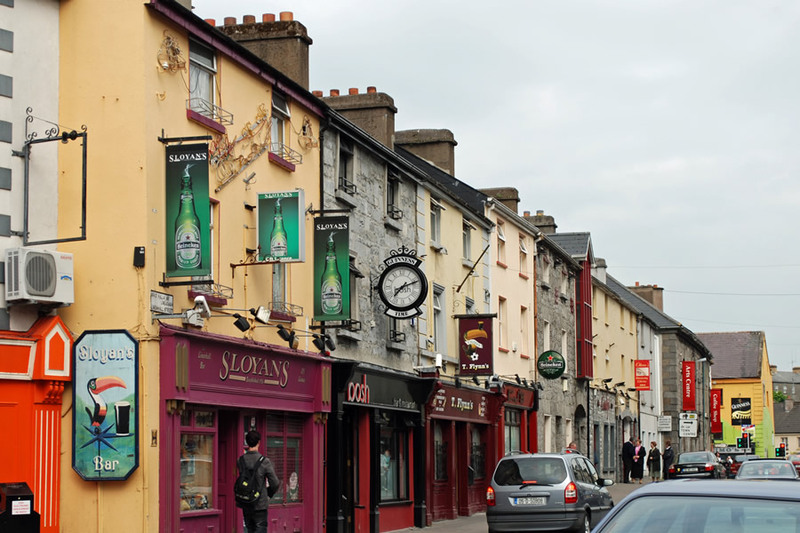 Castlebar town is approximately 2km from the resort so it’s a drive, unless you are into a good walk. The kids really enjoyed the holiday and when we collected them from the kids club they begged us to see if there was a room available for that night, so we did and there was and we stayed a second night too - and are begging for us to return again which we plan to do. Great hotel for families with young kids. Kids are well looked after. Hotel is a bit shabby in places and a lick of paint or new carpets would help. Leisure Centre is very good, but again a revamp would help, this too is beginning to look old and shabby. wifi was not available in most of the hotel, i would not recommend going for breakfast after 8.45am as it was extremely busy after that. The Breaffy woods was very geared toward younger children. The grounds on the hotel were fab, swimming pool was excellent. We found that the Breafy House hotel was more suitable for us. Overall we had a lovely holiday, Thank you. WE , BOOKED THIS HOTEL FOR OUR DAUGHTERS BIRTHDAY AND 10 ADULTS AND 6 CHILDREN HAD A GREAT TIME, ITS PERFECT FOR A FAMILY BREAK, WE LOVED IT. I'm giving this hotel one star for its children's disco...and that's it. My husband, my toddler and I, along with a couple of other families with young children, spent a night there recently. While the rooms were big, and the grounds quite nice, the hotel itself was dull, depressing, and utterly stripped of character. While I could have gotten over the hard pillows and unsound-proofed walls, it was the food and service that got me. When ordering dinner in the main bar upstairs, along with the two other families, our mains came almost immediately, cold and tasting suspiciously like hospital food, while the rest of the table waited for their starters. We couldn't get the attention of the staff of young men running around like headless chickens, and when we did, we had to wait another hour or hour and a half for our desert. It was the worst experience I've ever had at a hotel/bar/restaurant - in fact, any establishment serving food. There seemed to be no one in charge of the five of so college-age lads who were running the show. When I mentioned it politely to the girl at reception on checking out, she replied, 'Yeah, the chef is just here for the summer, and was really stressed out.' There was a little 'sorry 'bout that' at the end of the conversation, but it came across that she felt more sorry for the 'poor chef'. And that was it. The kids entertainment was cute, and kept them busy and having fun, but what a woeful experience for the parents! excellent location, and value. staff exceptionally helpful, and would highly recommend to anyone. Stayed for 1 night at the Breaffy Woods Hotel (2adults / 2Kids). Room was clean and tidy, decent size , 1 double bed and 2 singles. No room safe. Breakfast was nice , usual options (Full Irish / Continental / Cereals etc) however the evening meal was fairly ordinary. Limited menu and fairly bland - think pub carvery standard - then lower your expectations. Leisure Center was good ... pool was a generous size, as were the changing facilities - although everything was a little dated - could do with a facelift. Steam Room , Sauna and Jacuzzi - all out of order during our stay. Overall it was OK - but I'm not sure I would stay again. 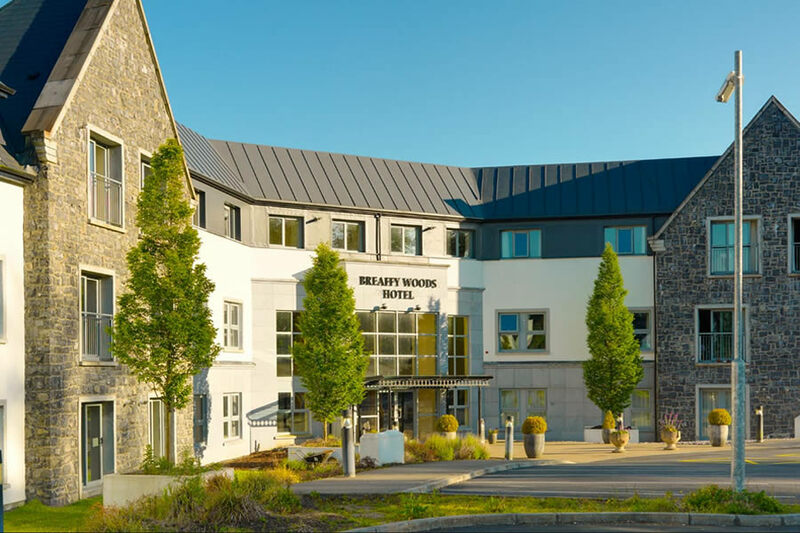 We were delighted with our stay in Breaffy Woods Hotel.Rooms were clean and well decorated.This hotel was very accomodating for children.Hotel was very busy when we arrived and was even busier by the time we left.Staff were very helpful. The staff are very young in the hotel, we asked for a pint of milk and a coke, the waiter came down with a pint of milk a coke and a pint bottle of cider??? For the baby we asked for soup and mash, they came down with gravy and mash. The breakfast the next morning was lovely except for the plates of toast which were stone cold, I asked the waiter for fresh toast which would be hot and he looked at me as if I had 2 heads. I got the bill for the coke and left €3 with the bill, when we were checking out the receptionist said there is a drink on your bill, I said we had no drink on the bill, it had worked out to be the coke, I said I paid for that after the meal, so someone obviously thought it was a tip. We loved our stay in Breaffy woods, the room was lovely and the food was excellent. They had a kiddies club which started the 1st of July, so our little one loved the disco, but what is wrong with Parents they just seem to let there kids loose like wild animals, I think the DJ should be allowed to announce to tell parents to stop there kids running around the place knocking small ones over. Night time was the same children running up and down the corridor and running outside like lunatics. Overall great hotel and will definitely go back. Really good value for money, kids love going back there. Staff are very friendly and helpful, I'd highly recommend for anyone with a family who are looking to get way. If staying at Breaffy I would recommend staying at Breaffy house and not the Breaffy Woods as it is a much nicer, old-style building with character. I found Breaffy woods to be functional but soul-less. We had to go up to the other hotel for dinner and for the bar as these facilities weren't available at Breaffy Woods. The pool (again in the other hotel) is good for kids. The staff in the bar were lovely. Very friendly and helpful. An overcharge on our food account was sorted immediately and very politely. Unfortunately, we had a frustrating experience with someone on the reception desk which is why I have rated at 2 stars. Due to a mix-up or technical issue involving the use of two different payment terminals at Breaffy Woods reception desk, 150e approx. was frozen on my debit card (pre-authorisation at check-in) and was unavailable to me for several days. I called reception about this after we left the hotel and was told that I would have to contact my bank myself to find out how long the funds would be frozen. Finally, it was agreed that the hotel would refund the payment made to my partner's account and pursue the preauthorised payment through my card. I was unapologetically told about the issue of the two terminals and that the funds would not be refunded to my partner's account for 72 hours. Mix-ups can happen but no apology was offered... just a tough luck attitude. I know people can have off days ...but when I emailed the hotel in relation to this issue and my email was ignored I realised that no apology was coming. Poor customer service in my book. I hope the hotel can sort out the issue of the payment terminals so that other guests are not inconvenienced in this way. This left us short of cash for the week and was an inconvenience. Just spent a night at Breaffy Woods Hotel and found the place clean and the staff very friendly and accommodating. The room was very spacious and had all that we needed. The one thing we didn't like was that, while wifi was available in the reception area, we had no wifi access in the bedroom. Staff in the restaurant were a little disorganised but the food was ok - dinner was included in the package we booked. We were confused about the offer to have dinner in Breaffy House as this wasn't explained in the booking information. The hotel is great value for money and ideal for anyone wanting to explore Mayo and use it as their base.